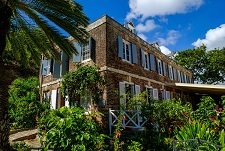 Antigua resorts and hotels: The Admirals Inn. The fascinating story of The Admiral's Inn continues to unfold. Each new visitor adds a chapter, discovering modern comfort amidst 200 years of nautical tradition. Located on the waterfront within Nelson's Dockyard at English Harbour, once a port for the Royal Navy and today a Caribbean yachting centre and a National Park, the newly renovated Inn is the perfect setting for a singular vacation adventure. 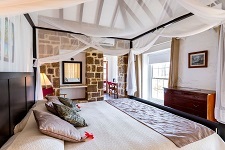 Our 14 double rooms, each with private bathroom with shower, are furnished with either twin beds or one queen-size. Each room is unique in size and character, depending on its location in the historic buildings which house The Admiral's Inn. It's a perfect location for big private events including weddings, parties, seminars, cocktail parties etc. 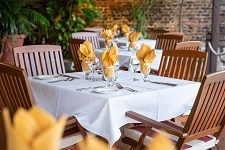 The Admiral's Inn offers quaint British charm, a holdover from the time when the handsome Georgian brick main building served as an engineers' workshop for the Royal Naval Yard where Admiral Nelson was once stationed. The interior of the Inn still bears the mark of history, with hand-hewn beams, wrought-iron chandeliers and a bar topped by an old work bench carved with the names of ships that once docked there. The restaurant is open daily, and utilizes locally grown vegetables and fruits and fresh fish to make up a fine varied menu. The charming terrace is covered giving great shade and breeze and offers a glorious harbour view where people come from all around to relax and dine or have drinks from the cozy bar. Although there is no beach on site, free transportation by boat or car is provided to Pigeon Beach or Freeman's Bay and they are only 5 minutes away. Many services and activities are within easy walking distance. The Admiral's Inn is a step back in time and a step forward in vacation pleasure: a special place to make a little history of your own. ADMIRALS INN & "HAVING A DRINK WITH HORATIO NELSON"